Day 21 of the new challenge from Books and Cupcakes where we will be focusing on children’s books! 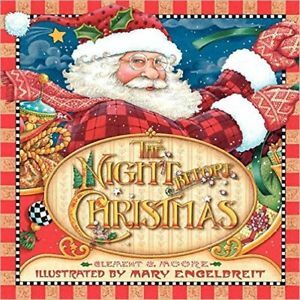 Every year we read the book ‘Twas the Night Before Christmas by Clement Clarke Moore pretty much nightly all through December and into January. It is a classic and a favorite within our household. Last year we read it so much, my daughter wanted to read it twice a night! Once I would read it and the second time would be her reading it to me. Now, she was not even 4 at the time so I know she was not really reading it the whole way to me, but she memorized the book and could recite it with ease. This year we are able to read it to our son too and he loves it and laughs right along with Sissy. The best part is when they see Santa for the first time and they both scream Santa so loud that it sends them into fits of laughter.